Today, most people own guns for safety reasons. 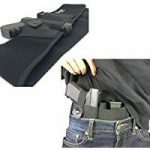 However, to avoid police prying or unnecessary tension in public places, a gun holster will be required to help you conceal your weapon from public eyes. Today, most firearm and tactical gear manufacturers have upped their game and designed some of the best multi-purpose gun holsters that can be used to store different types of handguns. Including several magazine pouches, and other personal items. Before purchasing a gun holster, the only homework you’re supposed to do is to identify the model/type of your firearm as well as your waist size to ensure that everything falls into place. This post will now review three of the best belly band holsters available in the market today. Tired of your elastic gun holster that pinches your skin and pulls off your body hair leaving you uncomfortable all day long? Well, you’re at the right place because this post will review one of the most responsive belly band holsters in the market today. The ComfortTac Ultimate Belly Band Holster is by far the safest and most versatile gun holster to consider for your everyday use. Designed with the latest surgical grade elastic material, this holster is gentle on your skin and is thick enough to support a wide range of full sized pistols and revolvers which include the 40 auto, 38 special, 45 ACP, 9mm, and 10mm among others. When it comes to selecting your best wears, the ComfortTac Ultimate Belly Band Holster works just fine. With its slim elastic features, this belly band holster works well with all types of wears such as skirts, jeans, shorts, sweat pants, gym shorts and more. To guarantee safety when found in a sticky situation, the straps of this gun holster are designed with a metal strap instead of Velcro to eliminate any noises when drawing your weapon. The manufacturer states that this belly band holster is capable of supporting sub-compact, compact and full-size pistols, a majority of customers have complained about the pouches stating that they’re too tight making it hard to draw/store your pistol. Highly comfortable—according to the manufacturer, this belly waistband can be worn in various positions across the body such as in the appendix position, inside/outside the waistband, behind the hip, cross body and under the armpits. Highly elastic—another outstanding feature worth noting is the neoprene material used to fulfill the stretching needs. This special feature allows this gun holster to stretch and fit a variety of different guns without making you feel uncomfortable. Silent draw retention strap—finally, the ComfortTac Ultimate Belly Band Holster is designed with a very responsive silent retention strap that makes it very easy and silent to draw your weapon. Finally, the ComfortTac Ultimate Belly Band Holster is among the best gun holsters available in the market. Designed with a neoprene material, this holster is thick, stretchy and perfect for both slim and large users. Although some customers have complained about the pouches, the overall performance and versatility of this gun holster make it the perfect alternative for customers looking for quality. The second belly band holster in this guide is the Belly Band Holster For Concealed Carry. Quite similar to our first product, this holster is made from a waterproof neoprene material that stretches out to fit small and large belly sizes up to 44 inches. The fabric is soft and gentle allowing you to wear the holster directly against your skin without experiencing any discomforts. The fabric is thick enough to fit small, compact and sub-compact pistols and revolvers such as the 40 auto, the 45 ACP, 380, 357, 9mm and 10mm respectively without feeling uncomfortable. 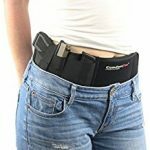 When it comes to the carrying option, the Belly Band Holster For Concealed Carry is versatile and capable of allowing a number of carrying options such as across the body, round the waistband, behind the hip, under the armpits, and in the appendix position. Designed to merge with a wide range of other tactical gears, the Belly Band Holster For Concealed Carry is one of the best handgun holsters to consider for all your shooting and security needs. 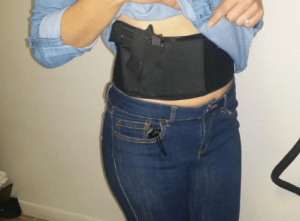 The Belly Band Holster For Concealed Carry is a functional gun holster that does exactly what it was designed to do, some customers have complained about the chemical smell produced when the product is new. What makes it even more challenging is the fact that this holster can’t be machine washed meaning you’ll have to clean it with your hands several times before the smell ends. Various carrying options—the first inspiring feature with this belly band holster is the availability of versatile carrying options. Apart from the normal waist option, shooters can wear this holster behind the hip, at the back, across the shoulder, and at the appendix position. Very comfortable—made from neoprene fabric, this holster is soft and very comfortable while wearing directly on your skin or on top other gears without feeling uncomfortable or embarrassed. 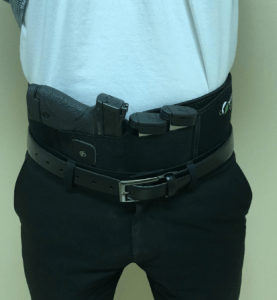 Last but not least, the Belly Band Holster For Concealed Carry is a versatile gun holster that’s both soft and extremely comfortable when wearing around your waist or across your shoulders. Made from neoprene material that stretches to fit all belly sizes up to 44 inches, this gun holster is the perfect solution to shooters and gun owners alike who enjoy concealing their weapons from the public eye. If you want to have this amazing gun, check it out here. Finally, we have the XL Ultimate Belly Band Holster. 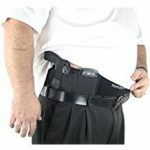 Available in black, this holster is made from neoprene material that stretches up to fit up to a 54-inch belly size. The fabric is soft and comfortable enough to wear directly on your skin while allowing you to wear any gears of your choice without any compromise. 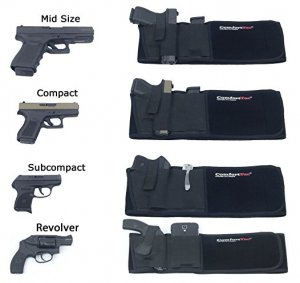 The XL Ultimate Belly Band Holster is a professional-grade gun holster that provides you with the necessary freedom and flexibility to store and retrieve your weapon from any position of your choice. According to the manufacturer, shooters can wear this holster on their hips, across the shoulder, behind the hip, mid-back and 12 O’clock among others. When it comes to the construction, the XL Ultimate Belly Band Holster is light and waterproof meaning the fabric can’t be affected by rainwater whatsoever. The pouches are easy and safe to open in case of an emergency thanks to the silent retention straps. Although the XL Ultimate Belly Band Holster is very responsive, one setback that has really disappointed most customers is lack of a breathable membrane. This means that your clothes such as T-shirts, dresses, and skirts can easily be soaked with sweat after a busy working day. High-end elastic fabric—one feature that makes the XL Ultimate Belly Band Holster the perfect choice for most shooters is the high-quality neoprene fabric that allows you to conceal a wide range of weapons without experiencing any discomforts. Multiple loops—next, this belly band holster is designed with multiple loops to allow you store extra magazines, flashlights, pistol and a tactical knife. To make it compact and tight, the manufacturer has added strong Velcro closures which are thick and soft enough to keep you comfortable. Finally, the XL Ultimate Belly Band Holster is one of the most versatile and responsive belly band holsters available in the market today. Available at an affordable price, this gun holster is flexible, wide and roomy enough to fit a standard pistol, a flashlight, several tools and a tactical knife. Although some customers have complained about the lack of a breathable membrane, the fact that this belly band holster has received a 4.5/5 star rating from 102 customers makes it the perfect choice for gun owners and professional shooters alike. All you have to do is to check out here and this amazing weapon can be yours. XL Ultimate Belly Band Holster is the best holster for women. i have recently ordered this for my wife she actually spends time on home alone and mostly she travels alone. You really hunt down the excellent article for your customers. Thanks, Happy to make a purchase by reading your article.